It’s easy to feel like you make no real difference in the world, especially if your are a doctor, teacher, or humanitarian. But this story helped to remind me of the little acts of humanity that affect individual’s lives that stay with them sometimes more than the big gestures. When my dad died 10 years ago I was a college student working in Yellowstone for the summer. I got the news from my mom as I stood at a pay phone. A man, on vacation with his family, walked by and noticed me crying, a minute later he returned alone with a handful of tissues and wordlessly handed them to me. In the following hours and days many of my friends and aquiantances reached out to me in big and small ways that were very appreciated and meaningful. But that stranger’s compassion, in that tiny gesture remains in my mind a decade later. 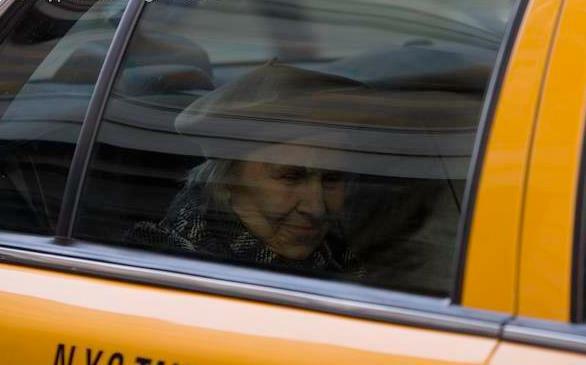 This taxi driver’s compassion for a old woman reminded me of those little gestures that really define who a person is. And it made me want to go visit my elderly upstairs neighbor. After a long pause, the door opened. A small woman in her 90′s stood before me. She was wearing a print dress and a pillbox hat with a veil pinned on it, like somebody out of a 1940′s movie.By her side was a small nylon suitcase. The apartment looked as if no one had lived in it for years. All the furniture was covered with sheets.There were no clocks on the walls, no knickknacks or utensils on the counters. In the corner was a cardboard box filled with photos and glassware. We drove in silence to the address she had given me. It was a low building, like a small convalescent home, with a driveway that passed under a portico.Two orderlies came out to the cab as soon as we pulled up. They were solicitous and intent, watching her every move. They must have been expecting her. I opened the trunk and took the small suitcase to the door. The woman was already seated in a wheelchair. On a quick review, I don’t think that I have done anything more important in my life. We’re conditioned to think that our lives revolve around great moments.